Martyriumsvorstellungen in Antike und Mittelalter: Leben oder sterben f�r Gott? Description: Concepts of voluntary death and martyrdom versus the ideal of preserving human life are an essential component of the Ethics of the Abrahamite religions throughout their history. The studies collected in this volume focus on concepts of voluntary death and martyrdom in the Hebrew Bible, Second Temple Period Judaism, Early Christianity and its pagan environment, Rabbinic Judaism as well as in Islam. The contributions of scholars of different background present a broad panorama of the varied perspectives of the Abrahamite religions on this phenomenon. The established concepts of martyrdom are challenged as too schematic. 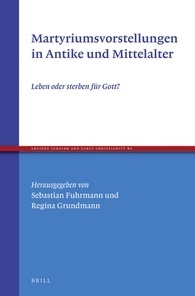 Citation: Thomas J. Kraus, review of Sebastian Fuhrmann and Regina Grundmann, eds., Martyriumsvorstellungen in Antike und Mittelalter: Leben oder sterben f�r Gott?, Review of Biblical Literature [http://www.bookreviews.org] (2014).